1774? – The year is uncertain, but sometime before 1776, Captain John Ames began the manufacture of shovels on Town River in West Bridgewater. The site of his forge and adjoining land are now the West Bridgewater War Memorial Park. 1779 – Oliver Ames, youngest son of Captain John Ames, was born in West Bridgewater on April 13. 1803 – Oliver Ames came to Easton, and on August 1, bought for $1600 a forge, nail-making shop, dwelling house, and several pieces of land near the Shovel Shop Dam on Pond Street. This dam and the shops had been built in 1792-3. He used the forge as a shovel shop and the nail-shop for making shovel and hoe handles. The famous Ames bend was made by putting the handles in the dam. 1805 – The first recorded date of making shovels in North Easton is April 17 when a Mr. Randall charged him $1.00 for carting six dozen shovels to Boston. No doubt he made shovels as early as 1803, and hauled them to Boston, (himself). Captain John Ames died during this year, on July 17, in West Bridgewater, and Oliver inherited the forge and land there. 1807 – Oliver Ames moved to Plymouth, Mass., and for seven years supervised the shovel-making plant of the Plymouth Iron Works. Their forges were on Town Brook above the lowest dam, which still exists on Summer Street. Oliver Ames also manufactured cotton-spinning machinery and other machines at the Plymouth Works. He lived in the “Long House” nearby (now numbered 120-122 Summer Street) and here his third son, Oliver, was born. He continued the shovel-making plants at North Easton and West Bridgewater. In association with Asa Waters he also manufactured hoes in Easton near the Hoe Shop Dam behind the Unity Church Cemetery. 1813 – Oliver Ames bought the land in Easton on which he now began to build his homestead, 25 Main Street, together with several large adjacent parcels. 1814 – Owing to the depression as a result of the War of 1812, the Plymouth Iron Works closed and Oliver Ames returned to North Easton. 1815 – Oliver Ames bought the shop at Hoe Shop Pond, which had been manufacturing hoes under the firm name of Ames, Waters & Co. He used the shop for making shovels, discontinuing the manufacture of hoes. 1817 – Oliver Ames made the first back-strapped shovels. 1823 – Oliver Ames built a dam and shop in South Braintree as an adjunct to his North Easton plant. 1825 – Oliver Ames, together with the owners of other water powers on the Queset River, raised and enlarged the Long Pond dam to conserve more water. A smaller dam had been built there in 1763 by Stoughton farmers to flood the meadows above. Shortly after the dam was enlarged (in 1826), he built a wooden shop there. 1826 – Oliver Ames built a stone shop, 40 feet long and 25 feet wide, as part of the main plant at the Shovel Shop Pond dam. 1828 – Oliver Ames built a stone shop at the Hoe Shop dam to replace the former wooden one. During this year, Ames Shovels broke ground for the B & O railroad in Baltimore. 1837 – Oliver Ames manufactured shovels worth $108,000 during the year, employing 84 workmen. 1844 – Oliver Ames, now 65 years old, turned the active management of his business over to his sons, Oakes and Oliver, giving each 1/3 interest, and retaining 1/3 himself. The firm, previously known merely as “O. Ames,” now became a partnership as “Oliver Ames & Sons.” The shop in Canton was acquired at this time. 1844-1845 – The dam at Flyaway Pond was built by the Company to conserve the water supply. 1845 – Oliver Ames & Sons manufactured shovels worth $132,000 during the year, and employed 72 workmen in their Easton shops. Twenty thousand dozen shovels were manufactured. 1847 – The Company built a small brick office or “Counting House” on Main Street, replaced by a larger one in 1863. The Company replaced its old store on Main Street with a larger one, 60 by 35 feet. Additional water privileges were purchased on Bolivar Street in Canton, and the dam was enlarged and a stone shop built there. 1849 – A large wooden barn to house the horses and oxen owned by the company was built on the corner of Oliver and Main Streets with a carriage house built just north of it, for the partners’ private horses and carriages. This was originally called the “Chaise House.” At this same time, the Gold Rush was taking place in California. Ames Shovels were so valuable there that they were used as currency. 1851 – The Long Pond dam was repaired with heavy stone construction. 1852 – (March 2) Fire destroyed the wooden shops grouped near the Shovel Shop Pond dam in which most of the manufacturing had heretofore been done. One thousand dozen finished shovels stored there were also destroyed. Carpenters were brought in from nearby towns and in less than three weeks temporary shops were built and work resumed. These wooden shops were so constructed that they might later be divided into dwellings, and some of the houses made from them still stand on Oliver Street. The building of new, permanent stone shops was now begun, with most of the stone coming from a quarry behind Frothingham Hall on Barrows Street. The stone for the previously built shops had been brought from Quincy. The Long Shop (530 feet) was built first, and the first steam engine (60 horse power) was installed in it. Prior to this, water wheels had furnished all the power. 1853 – The trip-hammer shop was built, and a second steam engine installed there. A new and larger carriage house and stable were built on the site of the old one. 1855 – The Company reported that they manufactured shovels valued at $600,000 in Easton during this year and employed 330 workmen. A private railroad line (opened May 16) for the shipment of shovels was built by the Company from North Easton to Stoughton where it connected with the Boston and Providence Railroad. Previously, the shovels had been carted to Canton, Stoughton, or to the steamboats at Fall River by four or six horse teams. He also had carted shovels to Taunton for shipping out the Taunton River. 1857 – The machine shop was built. 1861-1865 – President Lincoln asked Oakes Ames personally to supply shovels for the Union cause during the Civil War. 1862 – Queen Victoria granted a patent to William Newton to make Ames shovels throughout the British Empire. 1863 – Oliver Ames, Senior, died in his 85th year. His one-third interest in the firms was divided among his grandsons. Frederick Lothrop Ames, Oakes Angier Ames, and Oliver Ames were taken into the partnership, while his youngest grandson, Frank Morton Ames, was later made manager of the Kingsley Iron and Machine Co. of Canton in which Oliver Ames & Sons had controlling interest. A new and larger brick office was built on the site of the previous smaller one on Main Street (torn down in 1951). On the second floor of the new building were the first two banks in Easton: the North Easton Savings Bank and the First National Bank of Easton. 1865 – The Antrim Shop was built. Just north of it on Main Street and behind a small pond stood the Company’s blacksmith shop. This shop was torn down in 1931. The Antrim Shop was remodeled into a private garage. The Company reported that during this year they made 65,500 dozen shovels in Easton, valued at $982,500, and employed 250 men. The use of steam power and machinery accounted for the drop in numbers of workmen. 1866 – The Old Colony Railroad ran a line through North Easton, taking over the Company’s private branch to Stoughton. During this year, the Handle Shop was built. 1867 – The Plate-polishing Shop was built. 1868 – A canal from Picker Pond to the Hoe Shop was built. This year 120,000 dozen shovels were made and 500 workmen were employed. Orders were received from Europe, Australia, South America, Africa, and China. 1869-1870 – The new east wing to the Long Shop was built (sometimes called the “storehouse”). 1870 – Owing to business depression and failures of other firms, Oliver Ames & Sons was forced to ask its creditors for a temporary suspension which was granted. The liabilities were about $7,000,000.00. Within two years they paid all indebtedness with interest. During this time, Oakes Angier Ames invented the handle-bending machine. 1873 – Oakes Ames, the senior partner, died, and his sons, Oakes Angier and Oliver 2nd, inherited his interest in the partnership. 1875 – The Company reported that they made shovels valued at $1,500,000 employing 500 workmen. The rate of production was 450 dozen shovels per day. 1876 – The firm was changed from a partnership and became Oliver Ames & Sons Corporation: Oliver Ames, President; Oakes Angier Ames, Superintendent; Frederick Lothrop Ames, Treasurer; Oliver Ames 2nd, Secretary. Ames shovels won first prize at the Philadelphia International Exposition. 1877 – Oliver Ames died and Oakes Angier Ames succeeded him as President. 1879 – Ames shovels totaled three-fifths of the world’s production of shovels. 1880 – The New Plate-polishing Shop was built. Ames shovels won first prize in the Australian Trade Exposition. 1881 – During the year 127,000 dozen shovels were made and 422 workmen employed. 1886 – Production was 117,500 shovels a year (451 shovels each working hour of 10 hour day) with 500 workmen employed. A great freshet on February 12 nearly undermined the Long Pond dam. 1887 – The large barn on Main Street, built in 1849, was burned. Owing to the railroad facilities, fewer horses and oxen were now used, and these were stalled in the nearby carriage house. 1892 – The shop in South Braintree was sold. 1893 – Frederick Lothrop Ames died and his son, Oliver Ames, succeeded him as Treasurer of the Corporation. Ames shovels won first prize in the World’s Columbian Exposition in Chicago. 1897 – A new barn was built on the same site to replace the one that had been burned in 1887. The carriage house, which had been at the corner of Main and Oliver Streets, became part of the new barn. Also, Ames shovels were used to create the country’s first subway which opened in Boston. 1899 – Oakes Angier Ames died, and his son, Hobart Ames, succeeded him as President of the Corporation. Ames shovels were used in the building of the New York subways. 1901 – The Corporation was reorganized and the Ames Shovel and Tool Company, Inc., under a merger combined with T. Rowland’s Sons of Cheltenham, PA; the Wright Shovel Co. of Anderson, IN; the St. Louis Shovel Co. of St. Louis, MO; the H.M. Myers Shovel Co. of Beaver Falls, PA; and the Elwood Steel Plant of Elwood, IN. 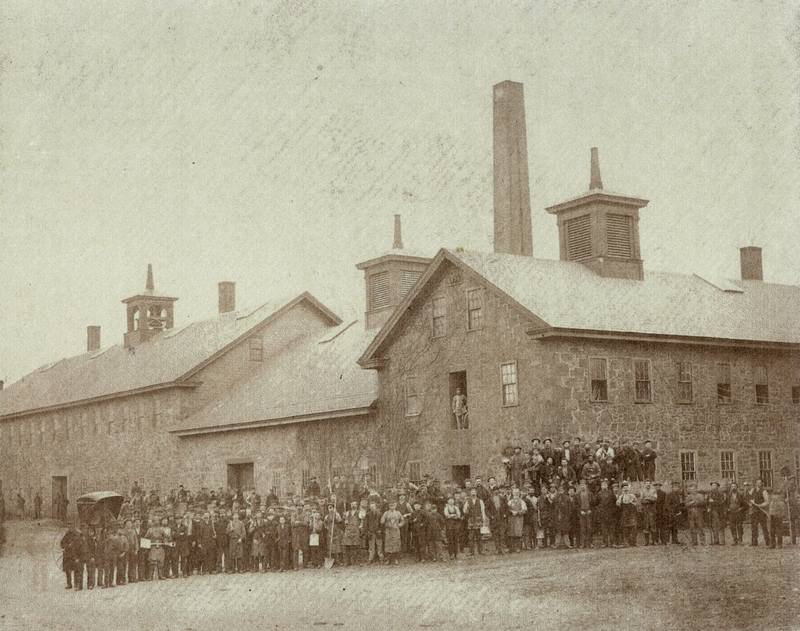 Handle-making plants in St. Albans, ME, Paris, Texas, and Warren, PA were also acquired. Hobart Ames was elected President and William Hadwen Ames, Secretary. 1903 – A part of the Long Shop was electrically lighted by a dynamo built by Hobart Ames and William Hadwen Ames. Previously all of the shops had been lighted by kerosene lamps. 1906 – Rate of shovel making was 376 dozen per day. Employees included English, Irish, Swedish and Portuguese. 1927 – The shop in Canton was sold. 1928 – William A. Ready succeeded A.C. Howell as President. The barn on Main Street, built in 1897, was remodeled into offices and occupied in the autumn of the year. 1928-1929 – A new shop of steel, glass, concrete, and asbestos, called the new Blade Shop, was begun August 28, 1928 and completed in 1929. 1929 – Herbert Hoover, Henry Ford, and Thomas Edison laid the cornerstone for Greenfield Village outside Detroit with an Ames shovel. 1931 – The Ames Shovel and Tool Company was reorganized and combined with other plants as the Ames, Baldwin, and Wyoming Co. Richard Harte, great-great-great-grandson of Captain John Ames, was elected President. 1932 – The main office of the Ames, Baldwin, Wyoming Co. was removed from Easton to Parkersburg, West Virginia, owing to the latter’s more advantageous geographical position. The Easton works, however, continued in operation. The Company entered the garden tool field. Five thousand different types are made. 1952 – North Easton plant began to close down. Name was changed to O. Ames Co.
1972 – North Easton plant sold to Tofias Real Estate of Brockton. 1976 – The Ames shovel display, which had been honored in the centennial exposition in Philadelphia, was also honored in the bicentennial exhibit in the Smithsonian Museum in Washington, D.C. The display was on loan from the Arnold B. Tofias Industrial Archives at Stonehill. 2004 – The headquarters of the company, now Ames True Temper, is located in Camp Hill, Pennsylvania. 2007 – The buildings were sold to Easton Shovel Shop LLC.